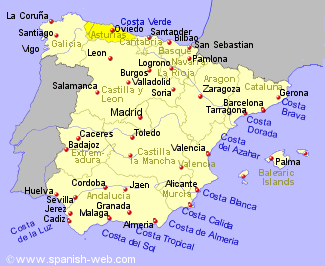 Asturias lies between Galicia to the west, Cantabria to the east and Castille-Lyon to the south. It has the best milk in Spain which is made into creamy blue Cabrales cheese and there is a tradition of milk puddings one being Arroz con Leche. Altogether there are over a hundred different cheeses produced here. It is famous for the smoked black Morcilla sausage that goes into Asturias' flat bean dish, Fabada. With the winters being bitterly cold there is no growing season at that time of year and summer harvests must keep families going until the spring. Maize, grain, beans and vegetables are hung in sheds to dry. Pigs are slaughtered, salted and cured to provide meat for winter eating. The rivers provide salmon and trout and the Bay of Biscay a variety of seafood which is made into a stew called Caldereta de Pescado. Two hundred and fifty varieties of apples are grown locally together with plums and pears. Desserts include apple tarts, pears in red wine with cinnamon (invented here) and superb sugary Marron Glaces. Apple pies are also a favourite and although little wine is produced in Asturias there is the ' wine of the apple' Sidra, cider, which is good with seafood.